Psalms 45:7 you have loved righteousness and hated wickedness. Therefore God, your God, has anointed you with the oil of gladness beyond your companions. Acts 2:44 And all who believed were together and had all things in common. Romans 5:1-2 Therefore, since we have been justified by faith, we have peace with God through our Lord Jesus Christ. Through him we have also obtained access by faith into this grace in which we stand, and we rejoice in hope of the glory of God. Ephesians 4:4-6 There is one body and one Spirit—just as you were called to the one hope that belongs to your call— one Lord, one faith, one baptism, one God and Father of all, who is over all and through all and in all. Matthew 5:22 But I say to you that everyone who is angry with his brother will be liable to judgment; whoever insults his brother will be liable to the council; and whoever says, ‘You fool!’ will be liable to the hell of fire. 2 Peter 2:9 then the Lord knows how to rescue the godly from trials, and to keep the unrighteous under punishment until the day of judgment. 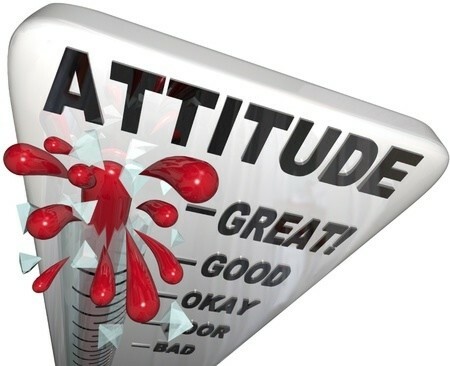 What is your attitude today? Are you bitter and carrying around anger or jealousy or even rage towards another person? Sometimes we even carry around those feelings towards God. Friends, adjust your attitude where God (through His Holy Spirit) is showing you it needs to change. God loves you the way you are but He loves you too much to leave you that way. Seek the Lord your God today! Very helpful , Thank you Daryl! Very powerful and helpful verses, that will help me obtain a better and positive attitude. Thank you for these verses. They really helped me. Amen. I have such a HORRIBLE attitude and it’s held me back all of my life, I’m 46. I need to remember these scriptures. Thank you. Thank you for this post. I am trying to study the bible. So helpful. Attitude is fundamental in the human person and so should be treated with all the good it deserves. I like talking about attitude and leadership. Please help me with reading materials on both Attitude and Leadership. Next post: What Does The Bible Say About Bullying?